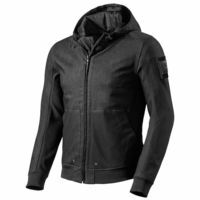 The waterproof and breathable REVIT Stealth takes the appearance of a wardrobe must-have hoody and incorporates motorcycle functionality into it. Poly/cotton stretch denim 3L is laminated to the hydratex waterproof membrane to create an outer shell with minimal water pickup. The critical impact zone of the elbow sports two layers of PWR | shield to boost the abrasion resistance of the jacket. Extremely thin CE-rated Seesmart protectors at shoulders and elbows make sure the hoody looks like its non-motorcycle equivalent thanks to the ability to form to the body. The REVIT Stealth is prepared to house a Seesoft CE-level 2 back protector (sold separately) and the standard equipped short connection zipper enables a rider to connect the hoody with any REV’IT pants or REV’IT jeans when using the Safeway belt (sold separately). Before departure, the hood can be held in place with the anchoring button to prevent it catching the wind. $17 Promotional Gift Card available on this product! We measured and tried on all the sizes in this overshirt and developed the size chart below to help you buy the right size. The overall fit is trim… some call it a “European” cut, which means it is close fitting and will work best for those with a trim build. For most people, you’ll find that you have to buy one size larger than you usually wear in men’s clothing. The exception would be a person with a tall, trim built who prefers the European fit. We put a Medium and XL on our two Fit Check mannequins Huey and Dewey. We generally buy test jackets in a Medium for Huey and an XL for Dewey (41” and 45” chest respectively) assuming these jackets would fit “normally”, and were able to get them on the two mannequins, but it was a very tight fit. Sleeve lengths are noticeably generous. The arms are fairly trim so those with stout builds probably won’t like the overall cut, but taller and leaner cut people probably will love it.